I have a MicroSD card in a USB adapter (which plugs into a USB port on my machine, and acts like a USB flash drive). I was using Unetbootin to make this a bootable USB flash drive with Kubuntu. But I needed to cancel while it was working. So I killed the Unetbootin process from the console. Since then, I can't format the MicroSD or delete the folder that Kubuntu made. I have also tried mkdosfs, with no success. I can't mount the drive anymore either? What can I do to make this drive usable again? Trying to create a new partition table in GParted, as described in Eliah Kagan's answer, does not work. It fails with the error message "imposible crear tabla de particiones" ("unable to create a partition table"). Memory cards and USB pendrives have the same kind of hardware inside, so the same methods are relevant to both kinds of devices. The term 'drive' can refer to a USB pendrive as well as a memory card (and the memory card can be connected via a USB adapter or a built-in slot in the computer). Confusion: There is some data in the drive, that makes the partitioning tool confused, to think that the drive does not work. 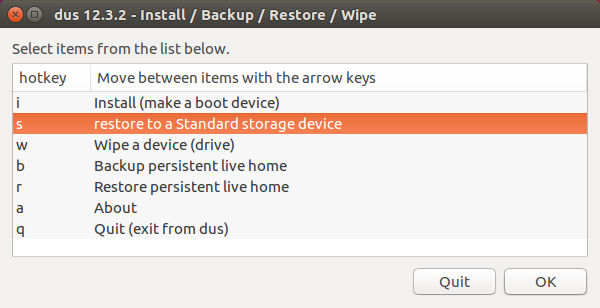 In this case you can simply 'wipe' part of the drive (overwrite with zeros). It is usually enough to wipe the first megabyte, the megabyte at the head end of the drive. On some pendrives and on many memory cards there is a small mechanical switch for write protection, that can toggle between read/write and read-only. You might have set it read-only without intention. Reboot the computer and try again to restore or wipe the first megabyte with mkusb. Disconnect other USB devices. Sometimes USB devices can disturb the function for each other. Try other USB ports, and/or other card adapters. Try another operating system (Windows, MacOS) in another computer. should list the drive in a way, so that you can identify it. The following command line is even better, because it lists also the model (which typically includes the brand name and/or model of a pendrive or a card adapter). Try according to the list in the previous paragraph, 'The drive is read-only: "On some pendrives ..."', if the drive is not found. If the drive is found and recognized as a mass storage device, there is hope that you will succeed according to the next chapter. Install and use mkusb (mkusb-dus), which can format alias restore a drive to a standard storage device (with an MSDOS partition table and a partition with the FAT32 file system). These instructions are relevant for many kinds of drives (USB pendrives, memory cards, hard disk drives, HDD, solid state drives, SSD), but probably most often used for USB pendrives and memory cards. if there are traces from a RAID configuration on the drive. let mkusb wipe the first megabyte and after that use another tool, if you want another partition table and/or other file systems. gparted is a good tool, if you are running a graphical user interface (window manager or desktop environment). If mkusb fails, the drive is either not found by the system or read-only. In this case you should try according to the list in the paragraph 'The drive is read-only' (above). This is a bit late, but here's my input. After this I could use GParted again, and it worked perfectly. Obviously the first block was not the problem, but the problem lay somewhere between there and block 40. Unmount the usb drive first and then format it with GParted. Install the gparted package in the Software Center (or in the Terminal/Konsole by running sudo apt-get update followed by sudo apt-get install gparted). This gives you the GParted Partition Editor. Then run GParted. Find the MicroSD/USB drive in the list of devices in the drop-down menu at the upper-right corner of the screen. Make sure you have the right device. (You can look at its size to help gauge this.) It would be very bad if you accidentally formatted a different drive that had valuable data, or your Ubuntu system, on it! With the correct device selected, run Device... > Create Partition Table.... Use the default options (i.e., just click Apply, don't change the option under Advanced). Please note that, while other modifications in GParted are only performed when you apply your changes, creating a new partition table wipes out anything on the drive on which it is done, and is performed immediately when you click Apply. Now create a FAT32 partition on the device (or a FAT16 partition if it is very small, like just a few megabytes, or if you know you need a FAT16 partition, for example, because you are following directions that call for a FAT16 partition). The new FAT32 partition should cover the whole drive (which is the default in GParted). You'll see the partition there, but that's just showing you what it will look like when you apply your changes. Then apply your changes (by clicking the green check mark). Quit GParted. You should be able to find the new partition in any Nautilus (i.e., file browser) window, under Devices on the left. Mount the partition by clicking on it under Devices in Nautilus. Now you should be able to write to it with UNetbootin. Click on unmount volume if it mounted. If an error arise, try to unmount it from the Desktop, if still an error arise, then remove it and plug it in again. After finishing deleting, click on Create partition and choose NTFS and leave the default. This steps I tested myself, please if there is anything else, tell me. Not the answer you're looking for? Browse other questions tagged usb live-usb gparted ram format or ask your own question. How to get my laptop to detect SD cards inserted into its built-in card reader? Micro SD card shows wrong capacity and files disappear. Can it be fixed? How to restore the original size of this flash drive? I failed to safely eject my USB drive and data became invisible… how do I get it back?